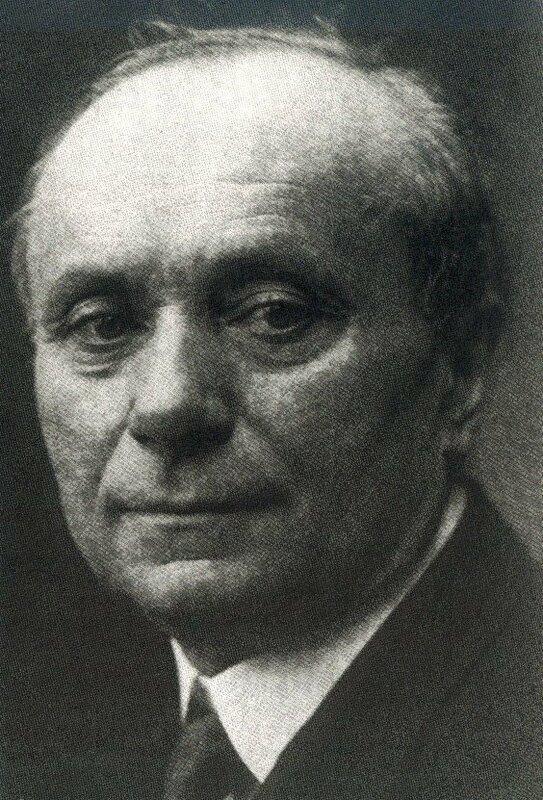 Charles Arnould Tournemire (1870 – 1939) was a French composer, organist, and accomplished improviser. His compositions include eight symphonies (one of them choral), four operas, twelve chamber works and eighteen piano solos. Today he is almost exclusively remembered for his organ music, especially L’Orgue Mystique, a set of 51 suites of pieces for the liturgical year based upon the chants of the day. He studied organ with César Franck. From 1898 to 1939, Tournemire served as the organiste titulaire at Franck’s old church, the Basilique Ste-Clotilde in Paris. He was also professor of Chamber Music at the Paris Conservatoire. In 1931 he published a biography of Franck. 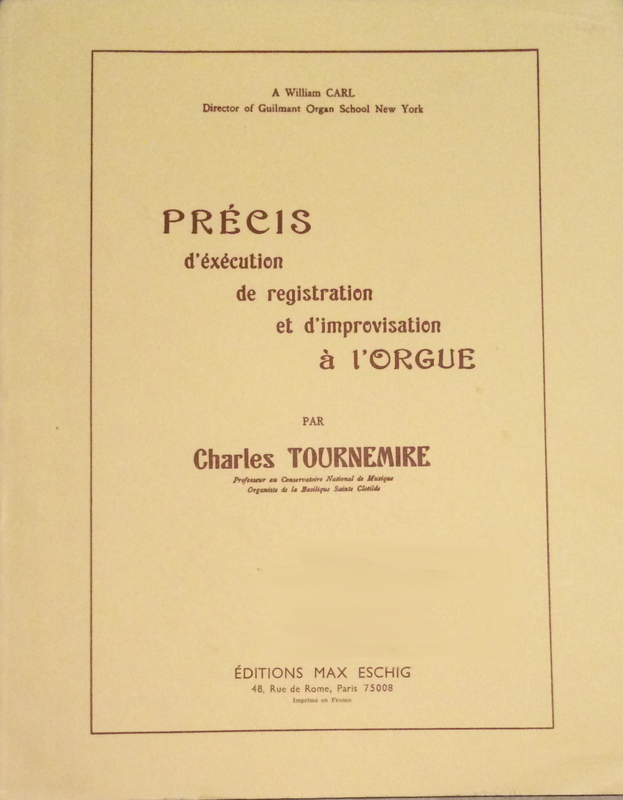 A year before the biography appeared, Tournemire recorded five organ improvisations, which were later transcribed by Maurice Duruflé from the phonograph recordings. These recordings and most all of his improvisations were often rooted in the music of Gregorian chant. 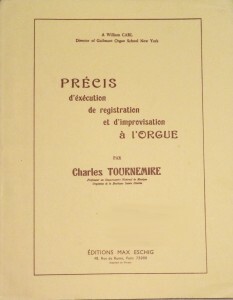 In 1936, Éditions Max Eschig published Précis d’éxecution de registration et d’improvisation à l’orgue by Charles Tournemire. Of the 117 pages, only the last 16 are devoted explicitly to the art of improvisation. Much of the text is devoted to philosophy, references to examples in repertoire, with some explanation of forms. Tournemire writes that the most profitable study that one could do is to read each day a sonata of Haydn, Mozart or Beethoven, and then to take the same elements and try to develop them oneself. Posted in Book, Organist. Tagged Book, César Franck, chant, Charles Tournemire, France, French, Maurice Duruflé, Paris, Ste. Clotilde, Victimae paschali laudes. In addition to the offerings at the AGO National Convention in Boston, there are several other courses around the world offering improvisation instruction during the summer of 2014. Please feel free to share information about other courses in the comments. I will try to add to the list as I find out about other offerings. 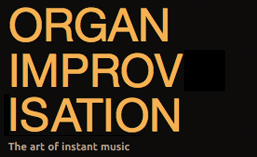 The London Organ Improvisation Course is intended to help organists of all standards to improve their improvising skills for personal musical development, service-playing, concerts and for the examinations of the Royal College of Organists. One day of the course will take place in St. Albans and will include a concert by the guest teacher, Franz Josef Stoiber, Organist of Regensberg Cathedral, Germany. Other teachers for the course include: Ronny Krippner, Duncan Middleton, and Gerard Brooks, Course Director. Workshop I: June 30-July 4 / Monday-Friday, 9:00 a.m.-5:00 p.m.
Workshop II: July 7-11 / Monday-Friday, 9:00 a.m.-5:00 p.m.
Two weeklong 18th-century keyboard improvisation workshops in which students will hone their improvisation skills and deepen their understanding of the galant and high classical styles. There will be a special emphasis on the Italian tradition of partimenti and on Robert Gjerdingen’s galant schemata as a basis for keyboard improvisation. Analysis and listening will complement practical improvisation activities. The first workshop will be an introduction to style improvisation; the second workshop will examine advanced topics (including ornamentation and performance practice) and treatises (Quantz, C.P.E. Bach, Niedt, and the Langloz Manuscript). Improvisation for advanced students: an extended, 11-day course for advanced improvisers directed by Jürgen Essl (Stuttgart) and Peter Planyavsky (Vienna). Improvisation for beginners: A 5-day course with the Haarlem Stadsorganist Jos van der Kooy, well-known for his sympathetic and encouraging approach to professional organists lacking improvisation skills. Directed by Nigel Allcoat with guests, Prof. Erwin Wiersinga (Berlin University of Arts and the Martinikerk, Groningen), and Prof. William Whitehead (London). The first week is in Saint-Antoine l’Abbaye (12-19 July) and the second week is in Poligny (20-28 July). Improvisation instruction will be offered during this course by Francis Jacob. Will include sessions on improvisation: “Free Fantasia” and “Stylus Fantasticus” at the keyboards by William Porter and Edoardo Bellotti. Organ class on the 1784 Holzhey Organ in Obermarchtal Monastery with a visit to the ISAM (International Summer Academy of Music) Organ Class in Ochsenhausen with Jürgen Essl. Johannes Mayr will teach a participant’s free choice of repertoire from early Baroque to early Romantic and/or improvisation. Taught by Ansgar Wallenhorst, this workshop is open to organists at every level of ability who wish to develop their own creativity in improvisation either in the context of liturgical services or in concert performance. With a combination of group work in the mornings (9.00-12.00) and individual lessons in the afternoon (15.00-17.45), the workshop will be adapted to the abilities, tastes and preferences of the individual participants. Participants are invited to bring music which they already play or are learning as an indication and basis for developing according to their own level and stylistic preferences. Evening sessions will include, on Monday, an exploration of improvisational style in Irish traditional music Cas Amhrán Cráifeach – a poetics of religious and secular song from the Irish sean-nós tradition with Nóirín Ní Riain PhD, and a short recital on Tuesday. Posted in Information, Lesson. Tagged Ansgar Wallenhorst, Course, Erwin Wiersinga, Francis Jacob, Franz Josef Stoiber, Glenstal Abbey, Haarlem, Ireland, Irish, Italy, Johannes Mayr, Jos van der Kooy, Jürgen Essl, London, masterclass, Nicolas Pichon, Nigel Allcoat, Olivier Penin, Peter Planyavsky, Poligny, Robert Gjerdingen, Saessolsheim, Saint-Antoine l'Abbaye, Smarano, St. Alban's, Ste. Clotilde, Venice, Waldsassen, William Whitehead. 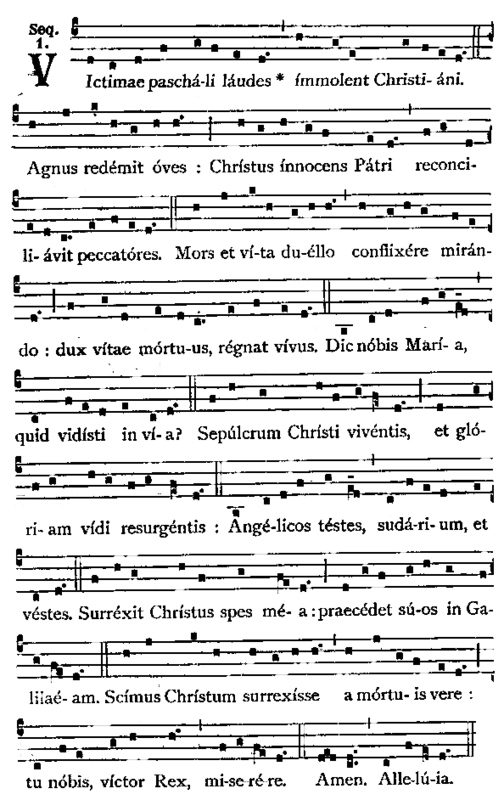 This is the chant hymn for vespers for the feasts of the Immaculate Conception and Assumption. The name Mary is said to mean “Star of the Sea” = stella maris. Posted in Themes. Tagged Assumption, Ave maris stella, chant, Charles Tournemire, France, Immaculate Conception, Mary, Paris, Ste. Clotilde. 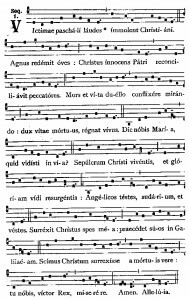 Victimae paschali laudes is the Sequence chant for Easter Day. Charles Tournemire recorded an improvisation on the chant which was later transcribed be Maurice Duruflé. This transcription has become a popular piece of organ literature. Posted in Themes. Tagged chant, Charles Tournemire, Daniel Roth, Easter, Eric Lebrun, France, Latin, Lorenzo Bonoldi, Maurice Duruflé, Milan, Paris, Sequence, Sergio Militello, St. Sulpice, Ste. Clotilde, theme, Victimae paschali laudes.